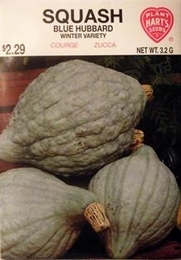 Blue Hubbard Winter Squash produces large hard shelled fruits that are gathered at maturity. Can be stored for a long time. Excellent baked or used as pie filling. Allow fruits to remain on vine until fully mature. Gather before frost, leaving part of the stem attached to the fruit. Handle carefully and store in a moderately warm, dry place during the winter. 2lbs of Squash seed needed per acre. Average Squash yield per acre - 8 1/2 tons.